Oodles of Zoodles! This is a healthy and delicious way of having pasta. No, I didn't buy another nifty kitchen gadget called spirilizer to spirilized the zucchini. I use a vegetable shredder which works just as well. To keep this meal healthy, I have it with a quick home cooked tomato stew and buttermilk roast chicken. sea salt and black pepper to taste. Chop tomato into small cubes. Heat the oil in the pan, fry garlic and add the chopped tomatoes. Throw in the herbs and add salt and pepper to taste. Cook tomatoes in low heat for about 10 minutes. Remove from heat and stir in the zoodles. Keep in the chiller for a day or two. Roast in 190-200C oven for 35-40 mins. You need carbo to fuel your day? then have it with dauphinoise potatoes which is also simple and easy to prepare. Slice potato thinly in even slices. Throw in the potato slices and let the mixture simmer. Using a slotted spoon, transfer potatoes to a baking dish,discarding the garlic. Pour over the cream mixture, just enough to seep through the layers. Bake in a pre heated 190C oven for 30-45 minutes till top is browned. Serving God is a great privilege, and service to Him must be rendered with excitement and enthusiasm. Last week was holy week where Christians across the world commemorated Good Friday and celebrated Easter Sunday. The Lord Jesus died on the cross for our mankind. He endured pain and sufferings. His death on the wooden cross is proof of the powerful love that God has for each of us. Therefore, let us glory in His cross, and praise the Lord for what He did for us. He has paid our debt, those who place their trust in Him for salvation are delivered from the debt of sin. All can be saved if we come to Him by faith. "He himself bore our sins" in his body on the cross, so that we might die to sins and live for righteousness; by his wounds you have been healed." I baked these chocolate hot cross buns with recipe adapted from Sonia of Nasi Lemak Lover. Preheat oven to 170C. Add in all ingredients except butter. Knead till smooth. Add in butter, Continue kneading until dough is shiny and smooth. Cover and proof in a greased bowl until double in size. Punch down the dough and divide dough into 9 portions. Roll in round balls and rest for 15 minutes. Shape the dough into roll and place on baking tray. Make the flour paste for the cross. Mix the ingredients till smooth. Fill in piping bag and draw cross lines on top of the bread. Bake at 170C for 20-25 minutes. Christ is risen! What joy we have on Easter Sunday as we celebrate Jesus' Resurrection. All who have believed in Him have been raised to a new life in Christ. Christ has transformed the lifeless and gives all new birth, a living hope through the resurrection of Christ. These mini vanilla cupcakes with strawberry Swiss meringue buttercream were baked for Sunday school Easter party. I always like my vanilla cupcakes recipe. I think they're great! moist and soft. These cupcakes were baked in my new oven and I noticed they were very unevenly browned:( This recipe yields 36 mini cupcakes. Combine egg whites and sugar in a pan over a pot of simmering water. Whisk constantly by hand until mixture is warm and sugar is non grainy. Transfer to the mixer bowl with whisk attachment and beat on low to medium speed. When bowl is cool, add the butter cubes, one at a time. Add in vanilla extract. Switch to paddle attachment and continue beating on low speed until mixture is smooth. Leftover butter cream can be kept in freezer for 3 months. To use, bring butter cream to room temperature and beat cream until smooth. A fast cooked dinner for son before he goes to work. Chicken Katsu, Salmon Teriyaki, Mesclun Salad and rice. Chicken Katsu is so easy and fast to prepare. To cook for one, you need one chicken breast cutlet, 1 beaten egg, 1 cup of panko, salt and black pepper to taste. Pound the cutlet with a rolling pin or a heavy meat cleaver if you have one. Heat the frying pan with cooking oil until the temperature is about 180C. Dip the chicken cutlet into the beaten egg, and coat it with panko. Shake off the excess and repeat the process. Gently drop chicken cutlet into the pot and deep fry until both sides turn golden brown. Dish out when chicken is done and lay it on a paper towel or greaseproof paper. Slice the chicken and serve. Heat up a non stick pan or grill pan till very hot. Pan sear and cook the salmon. Spoon sauce over the fish until sauce is syrupy. Dish and plate. To make the Tonkatsu sauce and Teriyaki sauce for single serving, these are the ingredients. The measurements are estimated. Taste as you mix. Whisk soy sauce, mirin and sugar and bring to boil. Add cornstarch mixture and whisk briskly. Reduce sauce to the consistency you like. Bible study for this month is on the Book of James. James wrote his Epistle to challenge his readers to examine their faith to see if it was genuine saving faith. For Christians to survive suffering and grow in maturity, we must have genuine faith. All of us face testing and trials which are unavoidable. We cannot face them effectively without Christ, our Lord and Saviour. He allows trials to come into the lives of His people. But he gives us the attitude of joy and ability to persevere if we have true faith and trust in Him. Happy Lunar New Year to all! I'm back!!! This Rose Chiffon cake recipe is created by my friend Angeline. I met Angeline during a food event about 2 years ago and we have been keeping in touch on Facebook and whatsapp. Angeline is a very talented and creative homecook, and this recipe was even featured in The Straits Times. I have baked this cake countless time because this is now my favourite cake to bake. I just love the colour and flavour. Do you believe me when I said I baked this cake with the oven turn off? My oven temperature setting has gone kaput, and when the power is on, it becomes very hot even at the lowest temperature. When this cake was ready to bake, I said my 'oven prayer', switched off the power and left in the oven to bake. I have no oven thermometer to check the temperature too. After 30 mins in the oven, I turned the oven on for 5 minutes and off again. The cake was done in 45 mins time and I have no idea at what temperature! My oven prayer is answered! This cake is very tall for a 5 eggs recipe in a 23cm tin. It is light and fluffy, the perfect texture of a good chiffon. This cake is just as good on its own but with the fresh cream, it taste even better. The fresh cream is whipped with condensed milk and sweetness can be adjusted to your taste. Mix 20ml rose syrup with 80ml milk. Combine egg yolks and sugar and mix well. Add the milk mixture, oil and essence and mix till well combined. Add flour into the yolk mixture and mix till combined. Make the meringue. Combine sugar and cornflour. Beat egg white till foamy then add half the sugar and flour mixture, continue to beat for a few minutes then add remaining sugar/flour mixture. Add the meringue in 3 additions to the yolk mixture, fold in gently till all whites are incorporated. Pour into a 20/21cm chiffon pan and bake at 150C for 40-45 minutes. When done turn the pan over and cool it upside down. Pour 300ml of whipping cream into a cold mixing bowl and whipped till soft peak, slowly drizzle in the condensed milk till stiff peak. Our recent study on the book of Philemon teaches us to receive and forgive those who have sinned. We were once runaways ourselves like Onesimus. We have to do what is right, even facing the consequences of our own sinful actions. The gospel is a message of second chances, and we don't hold past sins against people who have repented. Jesus took our debt upon Himself. He was created without sins to be the offering for our sin, so that we could be made right with God through Christ. Red Velvet Cake is always a crowd pleaser. There was once much hypes surrounding the red velvet cakes. People love the moist and tangy buttermilk cake with a bit of cocoa and the cream cheese frosting, and they go gaga over the red colouring in the cake. Red Velvet Cake has its humble beginnings and the cake dates back to the 19th century. It is red because a man from Texas wanted to sell more food dye and he figured red cakes could sell more! Red velvet cake is a dessert that everyone oohs and aahs over whenever I bring it to church functions. These are no exception. I baked for the Filipino fellowship monthly birthdays, and I was glad they enjoyed the cakes very much. There are many good red velvet cake recipes around. This is one which I like. After testing many red velvet cake recipes, I prefer one with a mixture of butter and oil. I find it more flavourful and denser than all vegetable oil recipes. Cream butter,sugar and salt until well combined. In another bowl, whisk in oil,egg,egg yolk,butttermilk and food colouring. Mix well. Add flour, baking soda and cooca to the mixture and mix gently until well combined. Do not overmix. Scoop batter into cupcake liners and bake till just firm, 18-20 minutes. Let cupcakes cook in pan for 5 minutes and transfer to a wire rack to cool completely. Whisk cream cheese, butter and icing sugar till combined. Add in vanilla extract and whisk on high speed till frosting is light and fluffy. My bible study group has just completed the Bible timeline study and we are now on the book of Psalms. 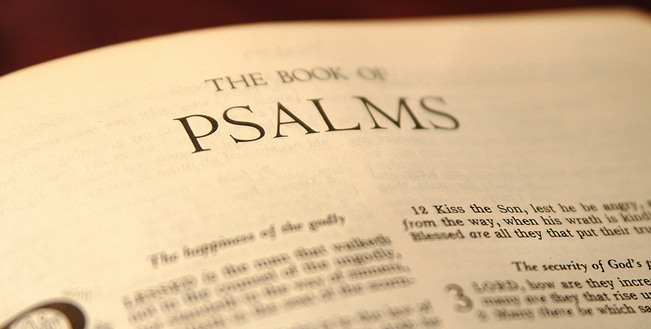 Why we choose to study Psalms? We choose to study Psalms to help us gain a fuller appreciation for worship. The Psalter is the favourite book for all whatever our circumstances maybe. We find words which are so appropriate to our needs to glorify, seek and talk to God. Martin Luther once said, " Psalms are a little Bible, and the summary of the Old Testament"
Our Lord Jesus himself also pointed out salvation in Him is written in Psalms.